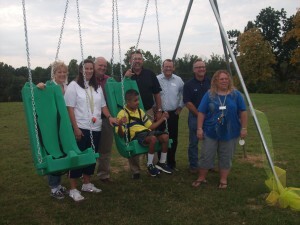 This grant funded an excellent sensory motor tool for us to use alongside our physical education program allowing us to create a safe and close environment for our special needs children to be able to swing without traveling to the Miracle League Field at Tyson Park. This entry was posted in Grant Recipients on October 8, 2014 by Chris Stecklein. Help us provide every child with a strong foundation by making your tax-deductible gift today. Or, if you would prefer you can make your PayPal gift today with just a few clicks. If your contribution is in Honor or Memory of someone, please let us know in the “Note” section as you process your Paypal gift. Graduation day is almost here…My hope for every student who will move on to the next chapter of their life next month is to find your passion.. Attention Faculty and Staff! If you’re looking for something to do over Spring break, how about applying for an SPSEF grant, and have the opportunity..
We are truly impressed by Arkhan’s determination, and we are proud to have educators like Derek Ratchford to encourage innovation and enthusiasm..
KNWA - Northwest Arkansas News KNWA's Clarissa Bustamante talked with a 12-year-old from Springdale determined to change his life and save his family thousands of dollars. If you’ve been on pins and needles waiting to see whose grants will be funded this winter, the moment you’ve been waiting for is finally here!..